Dandi Salt Challenge – why should you run it? Year 2019 marks the 150th birth anniversary of Mahatma Gandhi, and the Dandi Salt Challenge has been put up to recreate the footwork Gandhiji and his supporters did, in walking from Sabarmati, his ashram, all the way to Dandi, 401 kms away! This simple act of lifting a handful of salt, in defiance of the British levy of tax on salt, is called the Salt Satyagraha and marked the beginning of wide-spread civil disobedience across India against British. There are various events that are part of this Dandi Salt Challenge initiative, but the marquee event is the 401 kms run, over 10 days! The runners will be doing a half marathon in morning, and another one in evening, before retiring to their tents alongside the marathon route. And repeat the drill. For 10 days! Reaching Dandi on 23rd March 2019. For the first time in India – a running event comprising 2 Half Marathons run back-to-back and separated by 12 hours. Run them on the serene campus of IIT Bombay, Powai. The 1st Half Marathon, called the PM Run will be run at 4pm on Saturday, 1st December and the 2nd Half Marathon called the AM Run will be run at 6am on Sunday 2nd December 2018. Click on the link below for more details and for single registration for both runs. Your registration includes full support, snacks after both marathons and 2 T-Shirts. Come run in a first of its kind PM – AM, back-to-back Half Marathons. The event is a Curtain Raiser for Dandi Salt Challenge, March 2019, India’s first Historic Heritage Marathon on the Historic Heritage Route NH 64 from Sabarmati Ashram, Ahmedabad to Dandi a distance of 401 Kms. Covered in a series of 19 Half Marathons run in 10 days. Two Half Marathons every day. 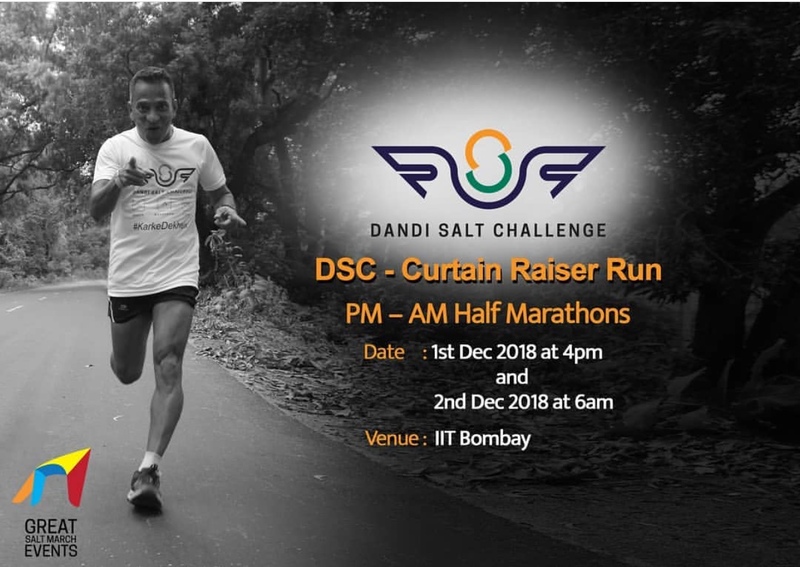 https://dandisaltchallenge.com Registration for the main Dandi Salt Challenge Events in March 2019 will start soon. So why should you be running this? And for Comrades aspirant, it does not get any better than this, to try out their pacing and nutrition strategies! All the best, and see you there! Owing to issues with security that arose in the aftermath of Pulwama attack, the organizers have decided to postpone this event. I await the revised dates from the organizers and will post them here.